The dollar continues to track my roadmap from September 3rd, when I first suggested a massive rally was on the horizon. The most recent update from October 29 nailed the bottom perfectly -- and if the dollar continues to track, then the dollar rally is about to accelerate even faster. The dollar appears on the verge of entering a nested third wave advance, which should soon explode to the upside. 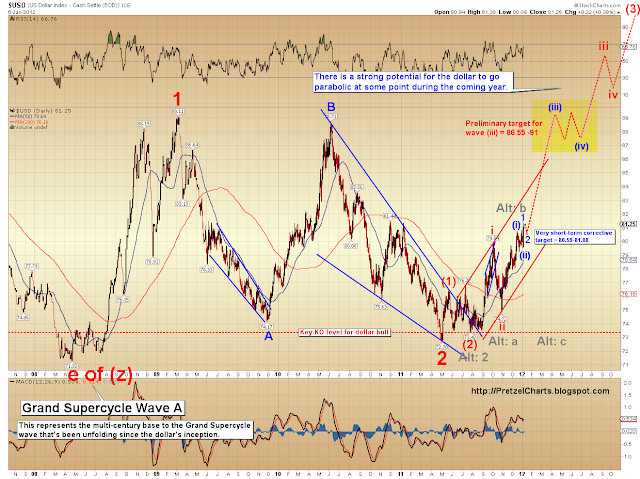 I have updated the daily dollar chart to show the targets for wave (iii) of iii of (3). If the short-term count is correct, the dollar may do a little backing and filling first, before launching higher in wave 3 of (iii). 79.83 is the level that needs to hold for the short-term view that the dollar has entered wave (iii) to remain viable. At the hourly level the dollar appears to have completed a small five wave advance, and may be due for a short-lived correction. Correction target box in yellow on the chart. It bears mentioning that this first wave is a very good-looking impulse wave -- about as clean as they get. If this is indeed the beginning of a nested third wave advance, it's always possible that the correction won't even make it down to the 38% Fib zone. PL Always love your analysis and the new guideline regarding the use of a Disqus ID. I now have one and will stop using Shine as my online ID. With regards to the dollar/euro, does the strengthing dollar signal a bull or bear case for the SPX? Bear case. Strong dollar indicates deflation. Equities have been rising primarily in response to QE inflationary signals-- i.e., they haven't been gaining "real" value. Strong dollar also hurts the bottom line of exporters like Apple, Caterpillar, etc..
Do you have an opinion on gold? Hi PL, not sure if anyone else is having problems Im not able to see any of the comments. I was able to last night but this morning they have all disappeared. Except for one on this post.